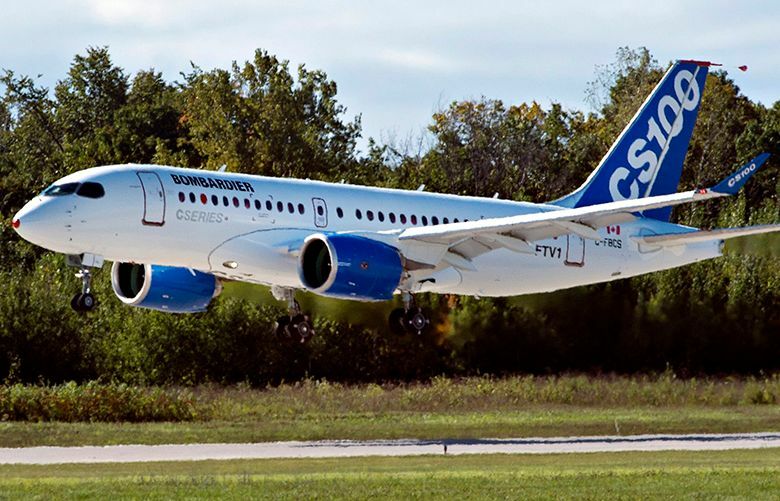 The European jet maker will have to factor in 18 A220s, the re-christened Bombardier CSeries jet it acquired this year, to meet its 2018 delivery target of 800 planes. Airbus acknowledged it must now rely on a Bombardier jet acquired this year to meet its delivery target of 800 planes in 2018. It’s the first time the planemaker has factored the impact of the purchase into plans to meet its forecast, after previously saying it wouldn’t need the A220s to do so. On Wednesday, the company said it would count 18 of the narrowbody jets — the re-christened plane formerly known as Bombardier’s CSeries — in this year’s total. The shift, announced with third-quarter results, highlights a production struggle that’s vexed Airbus all year, starting with an engine-related halt in production of its best-selling A320neo narrowbody. Now interiors and other issues are slowing output, so fewer will be handed over. Airbus on Wednesday also confirmed a Bloomberg report that delays from supplier Rolls-Royce Holdings will lower deliveries of its A330neo widebody. Despite the challenges, third-quarter profit more than doubled, as higher deliveries of its A350 widebodies swelled cash and outweighed the production stumbles. Costs on the program are coming down as output accelerates, helping to make the plane the cash driver Airbus has needed. Shares of Airbus were trading 5.6 percent higher Wednesday in Paris, taking gains this year to 19 percent. Rolls-Royce said last week that it’s running into production hurdles for the Trent 7000 turbines that power the A330neo, a re-engined version of its A330 widebody. The supplier had promised to deliver 30 power plants by the end of October, so Airbus could hand over 15 planes to customers by the end of the year. But in a memo to staff the British engineering firm said it would fall “far short” of the goal. On the A320neo, Airbus said the introduction of automation equipment in its factories hasn’t gone as smoothly as expected. Additionally, the long-range A321LR version requires a high degree of specialized work on the cabin. Finally, the engine delays earlier in the year put stress on its production system, and the company has had to juggle to keep up. “What is normally a pretty smooth operation came under fire from replanning of engines and aircraft,” Wilhelm said. Airbus has separately been struggling to pin down orders for two large aircraft, the standard version of the A330 and the company’s embattled A380 double-decker. Emirates, by far the model’s biggest customer, has been hesitant to make firm its commitment on an order announced earlier this year. The matter could hurt cash flow if not resolved by year-end. Moody’s Investors Service said Airbus’s year-end credit metrics may be lower than expected if the engine issues aren’t resolved, and that 2019 forecasts could be revised.